I never was a big fan of the television show Trading Spaces; I don’t think I’ve even watched more than two or three episodes. 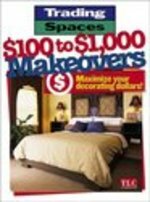 But my aunt gave me a copy of Trading Spaces: $100 to $1000 Makoevers—Maximizing Your Decorating Dollars and I do think it was a good buy. When we moved into the house my grandparents built after they’d both passed away, we didn’t really know where to start. For one thing, it was in dire need of a lot of repairs; it was also significantly outdated. And while we’re certainly not there yet, we’ve been able to save a lot of money and labor by doing updates by ourselves with the help of some of the tips in the book.